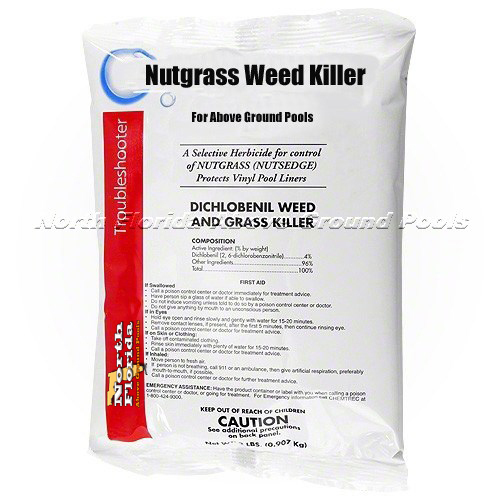 A Swimming Pool Installation Must Have – This is the hard to find granular commercial grade nutgrass killer. EPA approved and does not damage pool liners. Use this product to safely stop stubborn nut grass from damaging your above ground pool liner. If you are installing an above ground pool or changing a swimming pool liner, be sure to invest in this product and stop nut-grass cold. Use one bag for small pools, two bags for midsize pools or three bags for large pools. If you are unsure of your pool size, buy too much and use it all. There’s no such thing as too much nutgrass killer anywhere in the state of Florida. Use this nutgrass weed killer with Armor Shield pool floor pad for the ultimate pool floor protection.